While I was on the bench from running, recovering from the stress reaction in my left femur, I made the decision to introduce a more cushioned shoe into my rotation to try and reduce the impact on my legs. My normal training and racing shoe for the past 2+ years has been the Saucony Kinvara, which I love, but I was worried that this was not providing enough protection, especially on runs greater than 10 miles. 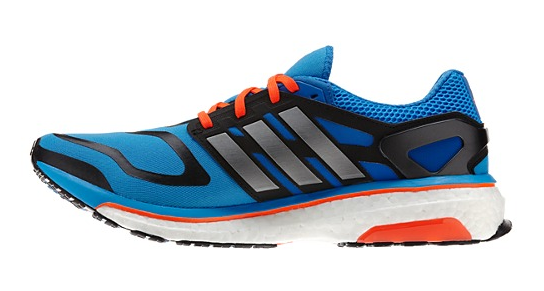 After doing a lot of research, and trying them out at Fleet Feet, I finally settled on the adidas Energy Boost. Adidas has put a lot of marketing dollars behind this shoe, which has generated a lot of hype regarding their new mid-sole “Boost” material. Instead of using traditional EVA foam, their “Boost” technology utilizes TPU (Thermoplastic Polyurethane) that is comprised of 2,500 little plastic pebbles fused together with steam and pressure. Adidas claims this material provides “industry-leading energy return,” maximum cushioning, and increased durability that will not be compromised in extreme cold or hot conditions like EVA foam. Adidas made lofty claims about the midsole material in its new Energy Boost shoe, including that it has “industry-leading energy return,” is resistant to temperature changes, and is more durable. But how did it fare when we put it to the test in the RW Shoe Lab? In terms of “energy return,” we can measure how much a shoe springs back–that is, how much of the energy put into the shoe on footstrike is returned on the rebound. Here, the Energy Boost truly is the industry leader: It performed better than any of the almost 800 other shoes we’d tested. Likewise, the claim about temperature resistance checked out. Typical EVA foam gets harder in cold weather and softer in hot conditions, affecting how much cushioning you experience. We tested the Energy Boost’s thermoplastic polyurethane against standard and lightweight EVA foams at 20°F and 120°F, and found it far less affected by the swings in temperature. Lab tests also indicate the foam appears to be more durable. With repetitive footstrikes, midsole material gets compacted as cell walls break down. Much of this happens early in the life of the shoe. Our tests indicated that the Energy Boost experienced half the loss of cushioning performance compared with other shoes with EVA midsoles, when mechanically loaded to simulate the first 10 miles of running. The fit of the upper is much more snug, stretchy, and sock-like than a traditional running shoe, and this has been a frequent point of discussion among the early adopters. I would highly recommend going at least 1/2 size up over your normal running shoe if giving the Energy Boost a try. For example, my dress shoe size is 9.5, my normal running shoe size is a 10, and I went with a 10.5 in the Energy Boost. During the first run in the Boost, I felt a little constricted in my right toes, but this subsided quickly. On all subsequent runs I found the snug fit to be extremely comfortable. The cushioning of this shoe is absolutely off-the-chart, and this comes from someone who used to run in the Nike Vomero, which is like a marshmallow. What is even more amazing is that the shoe is this cushioned, yet weighs less than 10 oz. I was initially concerned that it would be very awkward/difficult to run fast in a shoe with this much cushioning, but that is not the case at all. I really think there is something to the “energy return,” since it responds like a much less cushioned shoe. While the ride of the Boost, generally felt good, coming from running in minimal drop shoes like the Saucony Kinvara, Peregrine, and Hattori, the 10mm drop in the Boost felt significant. Running on the midfoot/forefoot was not comfortable, and I naturally dropped back to a heel-strike. While I can’t speak about this in great detail, after running over 100 miles in the Boost, the midsole and outsole show absolutely no signs of wear. I actually think that the upper above my big toe would wear out before the midsole on this shoe. Even with all of the positive items noted above, there is one major problem with the Energy Boost, and I’m hoping that it is not happening to other runners. Once my time running got above 30 minutes in my “return to running” program, I started having significant achilles tendonitis in both ankles. Having completed 13 marathons and 13 half-marathons over the past 4 years, I’ve never once had the slightest twinge in either achilles. This was obviously quite concerning to me. I did some experimenting and found that anytime I went back to the Kinvara, my achilles would settle down. Then when I would go back to the Boost, they would immediately flare back up, even getting to the point where I was having pain in my left calf. After going back and forth for a few weeks, I have now decided to abandon the Energy Boost, at least for the immediate future. I’m not sure why this is happening, but the Kinvara just feels so much better on my ankles. I don’t know if it is related specifically to the construction of the shoe or the move to a shoe with a significantly higher heel-to-toe drop. Whatever the case, the Energy Boost has now become my most expensive casual shoe. With all of this in mind, I cannot recommend the Energy Boost as a daily training shoe. 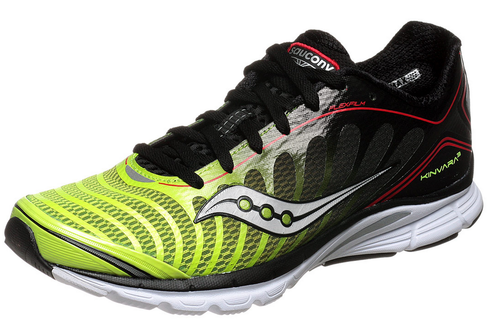 As for trying to incorporate a more cushioned shoe into my rotation, I may give the Saucony Ride 6 a try since it is a 4mm heel-to-toe drop just like the Kinvara, and I’m very familiar with the fit of Saucony shoes. For someone who desperately wants to run Boston, and is in love with the Saucony Kinvara, these limited edition Kinvara 4s are downright CRUEL! 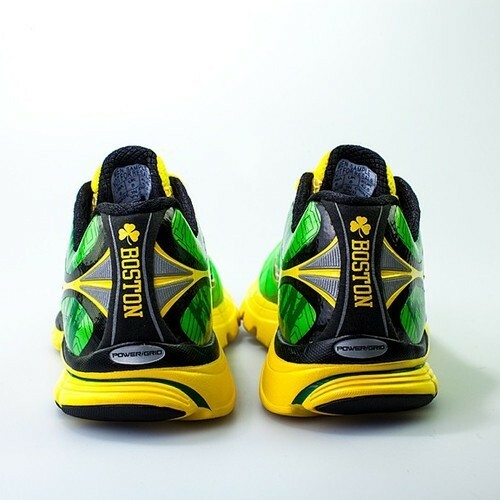 They will only be available at Saucony’s Boston Marathon expo booth or Marathon Sports in Boston. Running Warehouse just posted a preview video of the upcoming Saucony Kinvara 4, which is supposed to drop in May. 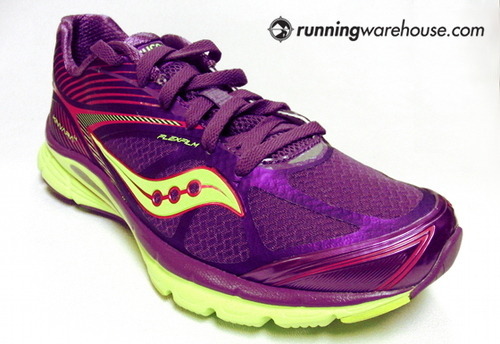 Running Warehouse just posted a preview video of the upcoming Saucony Kinvara 4, which is supposed to drop in May. Looks pretty sweet. I’ll be interested to see what the new “seamless bootie” feels like. The Saucony Kinvara has been my training and racing shoe of choice since its introduction in 2010. I’ve loved every version so far, and we got our first look at the upcoming Kinvara 4 (K4) last month on the Saucony blog. Today Running Warehouse posted some new pics along with a rundown of changes and color options for the shoe that will drop in May. Per Running Warehouse…The K4 retains many of the design elements of its successful predecessor, though a few tweaks (such as an improved upper and the addition of a PowerGrid heel insert) should make for a more enjoyable running experience. 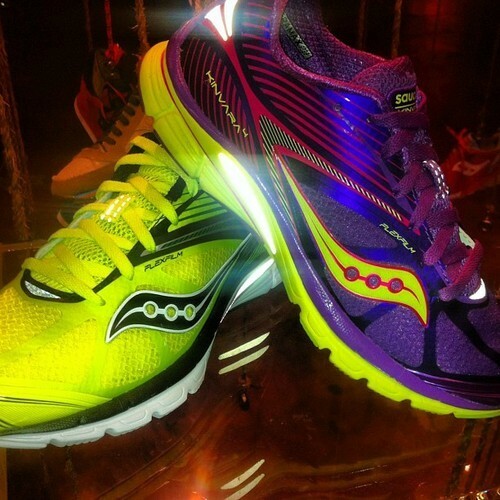 Saucony claims weights of 7.7 oz in a Men’s size 9 and 6.7 oz for a Women’s size 8. Revisited Upper: Overlays around the forefoot have been stripped down to increase breathability without sacrificing security, and a redesigned heel collar should reduce rubbing on the Achilles. Upgraded Cushioning: We expect that the switch from ProGrid to PowerGrid in the heel will deliver a smoother and more plush transition from heel to toe. Color Variety: The May 2013 release will consist of five colorways on both the Men’s and Women’s sides, so there should be something to suit everyone’s tastes. What do you think? Personally, I’m excited about the changes, though I do think the new overlay pattern results in a less attractive shoe than the K3. For the Kinvara 4, we upgraded the heel insert to our PowerGrid material, which helps to improve the cushioning level of this shoe. We’ve also adjusted the FlexFilm overlays from the Kinvara 3 to the 4. By exposing more mesh in the forefoot, we improved breathability while still maintaining great lockdown, and conversely we added more FlexFilm in the midfoot and heel area to really help frame and secure the foot through all phases of your gait. No word yet on the weight, but the outsole appears largely unchanged from the Kinvara 3. On a purely aesthetic note, the change to the Flexfilm overlays will not allow for the dramatic designs we see today in the Kinvara 3. Considering how much I LOVED the Saucony Kinvara 2 (K2) and original Kinvara (K1), I was extremely nervous about all of the changes in the Kinvara 3 (K3). However I now think the K3 is even more perfect for me than the K2 (I didn’t think that was possible). Single layer upper: The upper in the K1 and K2 was made up of 3 distinct layers including the top material, structural overlays, and an inner mesh (with fairly large holes). While this upper was comfortable, my big toe in both shoes would always catch on the inner mesh, slowly creating a big hole. The upper in the K3 is a single layer mesh (smaller holes), with structure being provided by new flexfilm overlays that are welded directly onto this layer. Not only does this eliminate the troublesome inner mesh, but it is also ridiculously comfortable. It creates an almost sock-like feel throughout the shoe. Larger toe-box: I mentioned above about my big toe catching in the mesh on the K1 and K2. Part of this was due to a fairly narrow toe box. While I like a running shoe to fit fairly snug from the heel through the midfoot, I generally prefer to have lots of room in the toe-box. The K3 is an improvement over the K1 and K2, because they have made the toe-box slightly larger, further adding to the overall comfort. Improved fit through the arch: In both the K1 and K2, I always felt a little bit of a bump in the outer arch that could be annoying. That bump is completely gone in the K3, and the fit is fantastic. Rounded heel: While I am certainly trying to be more of a midfoot/forefoot runner, I unfortunately still heel-strike more often than I would like. However, the new rounded heel in the K3 lessens the impact when heel striking, and makes the transition to toe-off a lot smoother. Another improvement is supposed to be in the durability of the K3’s outsole. At this point I have not put enough miles on the K3 to make a determination, however I never really had a lot of issue with durability in the K1 or K2. I’ll post an update when I have a few more miles in these babies. My only complaint is that they did away with the loop based speed lacing system of the K2 and replaced it with traditional eyelet lacing. The reason for this change was to spread out the lacing area (and reduce pressure), but it results in a little puckering of the upper when cinching the laces. Not a big deal. Overall, Saucony has taken what was already an awesome shoe and made it even better. Find Your Strong! What do you wear for your races? Nothing but the Kinvara for the past 1 1/2 years. 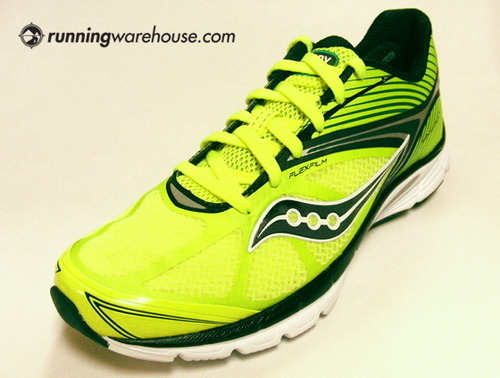 Tonight was my first run in the Saucony Kinvara 3, and I’ve got one word to describe it…WOW! I honestly thought the Kinvara 2 was the perfect shoe for me, and was very nervous about trying the new version. Well, this was by far the best a new shoe has ever felt out of the box. I’ll write a full review after a few more runs, but just had to share what an awesome shoe this is. How did the Kinvara 3 not win “Best Update” from Runner’s World Magazine? 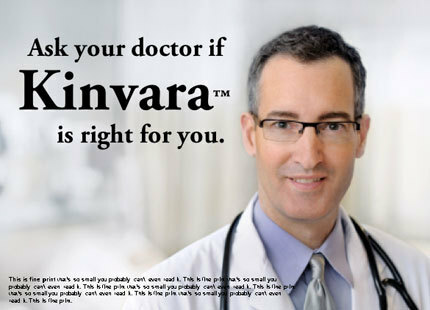 A few days ago, the RW Daily blog on RunnersWorld.com posted a quiz which contained a mixed list of running shoe and prescription drug names to see if you could distinguish between the two. While I didn’t think this quiz was particularly hard, I did like the graphic that went along with it which is posted above.